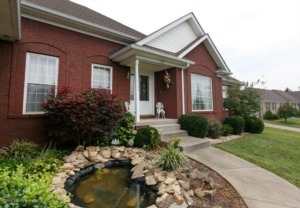 BEAUTIFUL is what will come to mind when you arrive at 104 Englewood Drive. One foot inside you will fall in love with the gorgeous hardwood floors throughout. The eat-in kitchen is perfection being adjacent to the family room, as well as having features like; a separate dining area, ample counter space, plenty of cabinets for your storage needs. The first floor Master Suite is fit for royalty with stunning trey ceilings and a private spa like bathroom. Three other well sized bedrooms, a second full bath, a half bath, and separate laundry/mud-room all allow for more comfortable living quarters. Just when you think this home as everything you're looking for the unfinished basement is waiting for your own personal touch. 2.5 car garage, outside patio looking over a stunning backyard. Don't miss your chance to claim this home! Click to schedule a private tour.